This is a sponsored post written by me on behalf of Shaw’s Supermarkets. All views expressed are my own. Now that the kids have been back to school for roughly a month, we have already all been sick. How is it possible that my kids manage to bring home these nasty bugs every year like clockwork? The truth is, I hate being sick as an adult because I do not have my own mommy here to take care of me. I guess adulting is pretty hard when you are sick! The good news is, I at least know some tips and tricks to keep my immune system in tip-top shape. I admit, I was not following my regimen and was skipping out of vitamins and healthier meals. I find the better I eat, the stronger my immune system becomes. 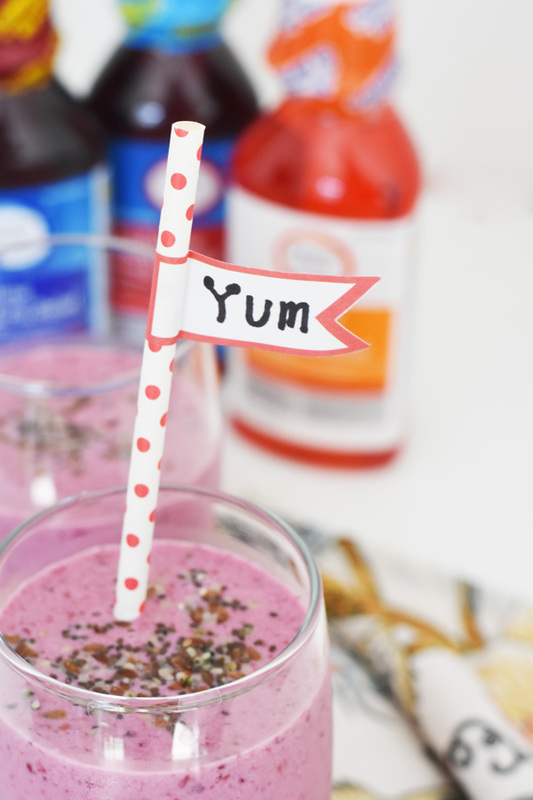 Drinks like this Quick Organic Berry Smoothie Recipe help my body to be stronger during the cold and flu season. Half the battle of preventing colds and seasonal sickness is to keep your body nourished, less stressed, and all around balanced. Eating clean, organic foods can help to keep one’s body fueled and in tip, top shape. However, eating organic foods can be expensive. 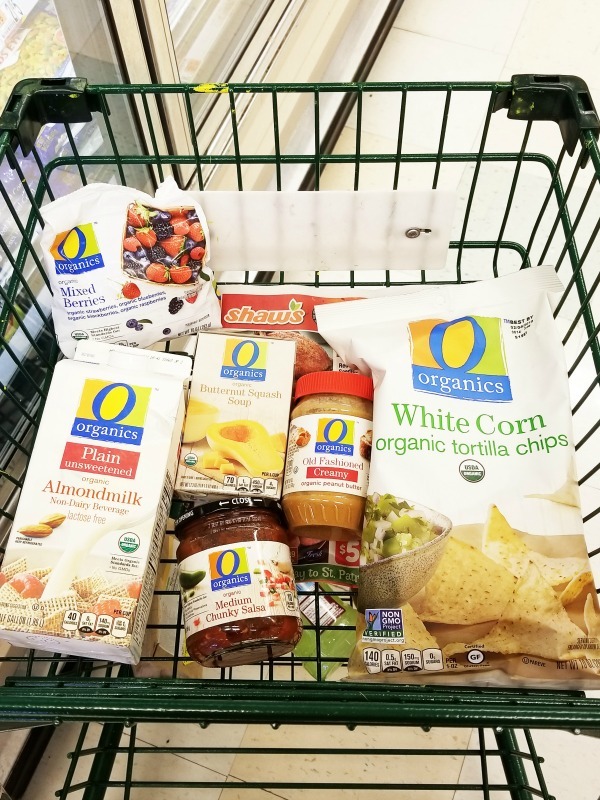 I shop at Shaw’s Supermarkets to stock up on the O Organics® line with products like eggs, milk, soups and more. Getting better for me ingredients at Shaw’s is super convenient and saves me time and money. This exclusive line of products is located throughout the store, and the items are priced perfectly. In fact, most are priced right around the same as national non-organic products. Thankfully, when I am sick there are products on the market to help keep me comfortable during my worst times. Here in Massachusetts, Shaw’s Supermarkets carry an exclusive line of effective and affordable products known as Signature Care™. 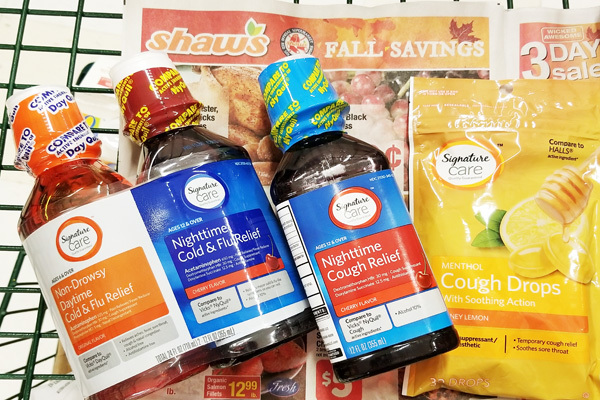 Shaw’s Supermarkets’ Signature Care™ Cough and Cold products are exactly what I needed to help me get over my nasty cold & cough. The Signature Care ™ line offers a variety of products and provides the same quality and relief that national name brands do, but at a better value. These pharmacist-recommended products contain the same active ingredients and are subject to the same manufacturing standards mandated by the FDA as national brands. This is exactly why I prefer this line over the top names. 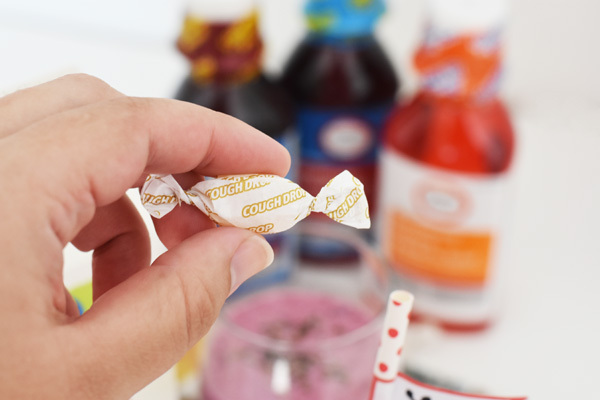 Since we mainly get colds with that persistent cough that never seems to end, we typically keep cough drops, daytime/nighttime meds, and cough syrup well stocked in our pantry. Due to just getting over a batch of colds, we were low on supplies so I picked up some: Signature Care™ Cough Drops Honey Lemon, Signature Care™ Cold & Flu Liquid Daytime and Nighttime, and some Signature Care™ Cold Medicine Nighttime Cherry. A good way to hopefully try to keep your immune system boosted is to eat fresh and organic whenever possible. While this cannot completely prevent illness, it can help your body fight off nasty bugs sooner! 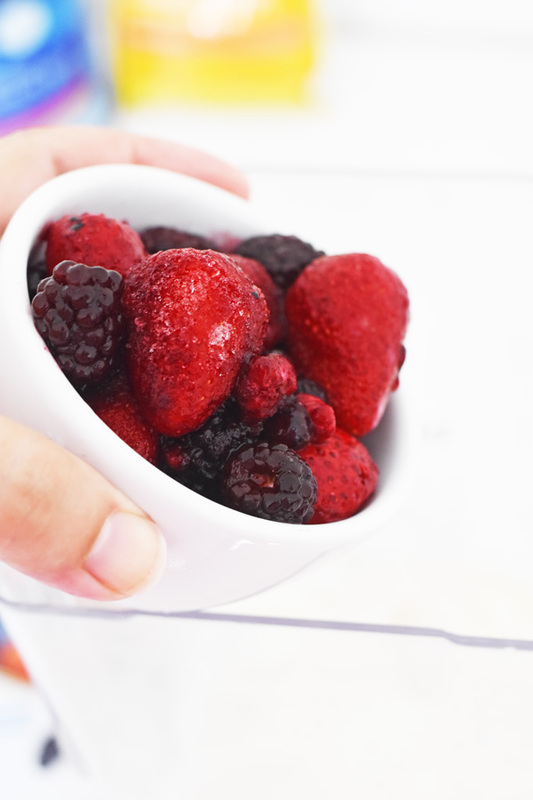 Start your day with this quick, easy, and inexpensive Organic Berry Smoothie to keep your body nourished. What are some ways you fight off nasty germs? 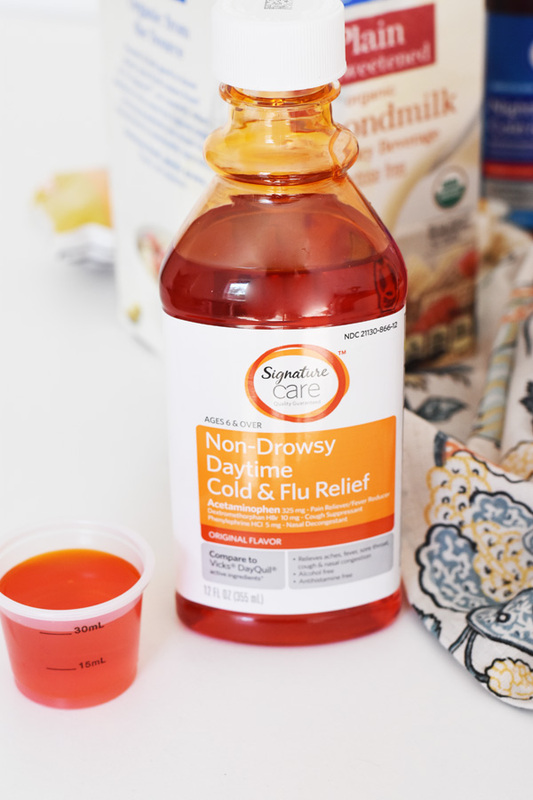 Have you tried the Signature Care™ line of cough and cold products? I buy Signature Care™ products at my Shaw’s Supermarkets, and you can also find them at all Albertsons Companies family of stores, including Albertsons, Safeway, ACME Markets, Jewel-Osco, Vons, Pavilions, Randalls, Tom Thumb, Star Market, United Supermarkets, Market Street, Albertsons Market and Carrs/Safeway. This is a sponsored post written by me on behalf of Shaw’s Supermarkets. All views expressed are that of our own. 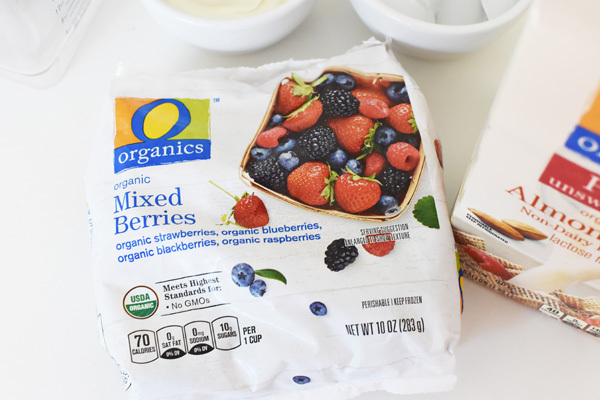 An organic berry smoothie that is 4 ingredients and easy to prep for busy mornings! 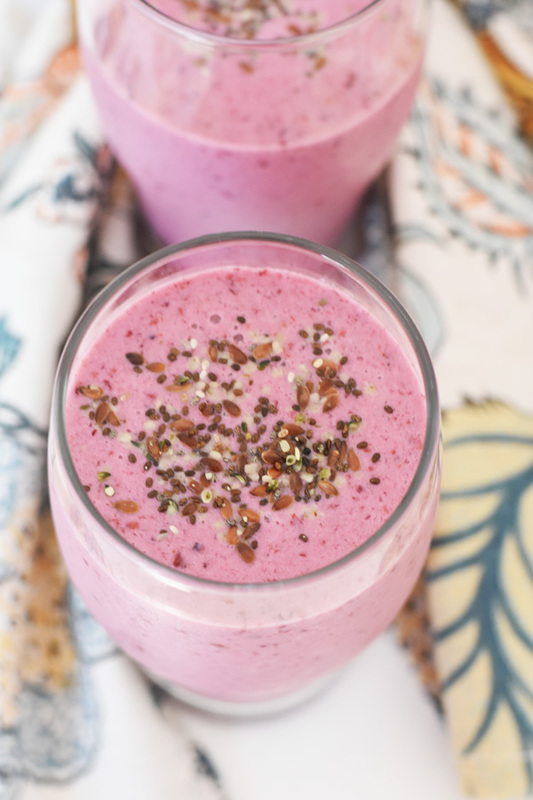 This recipe makes 1 large 16 ounce smoothie. 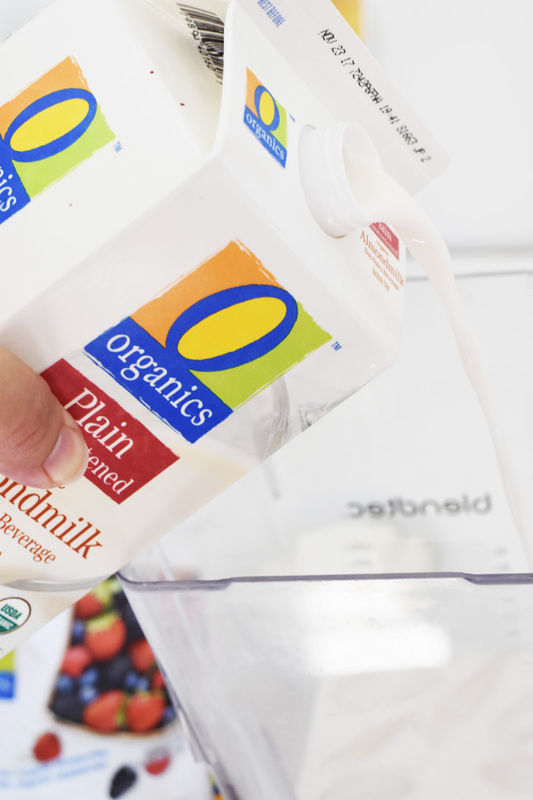 Add all your ingredients to a blender, and blend until smooth. Fill in a shaker cup and enjoy! That looks delicious! 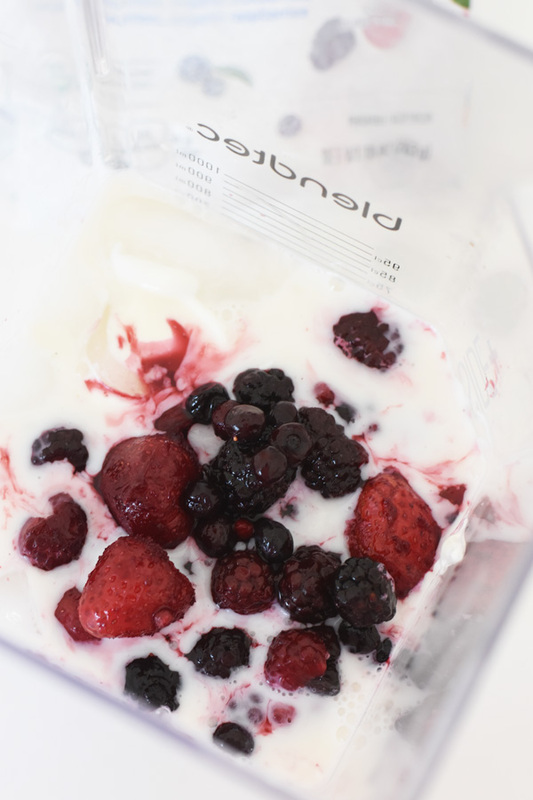 I love making smoothies because they’re easy, they’re delicious and they fill you up. I’ve never tried it with alomnd milk but I definitely think I need to. A glass full of healthy and the right OTC meds can generally get you through the cold season. I love this! That smoothie looks great and we only drink the non-dairy milk these days. The berries look like fresh so I will try and keep them on hand for this and other creations. That smoothie looks amazing! I have a smoothie almost every day, and when cold season rolls around, I go heavy on the antioxidants and vitamin C fruits. Thanks for the recipe! 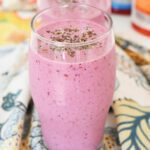 Mmmmm berry smoothie! That looks awesome! what a great thing to have every morning before work! I know I need to give my immune system a boost. There has been so much going on that I tend to forget about myself. This smoothie looks so good. Shaw’s has everything that we need! Easy to get to and love their SALES! I love smoothies. They’re a great way for me to get some extra nutrition in. I love to start my day with a healthy smoothie. I will have to look for these O Organics products when I go shopping this weekend. I am always looking for healthier options to feed to my family. What a wonderful way to start your morning! 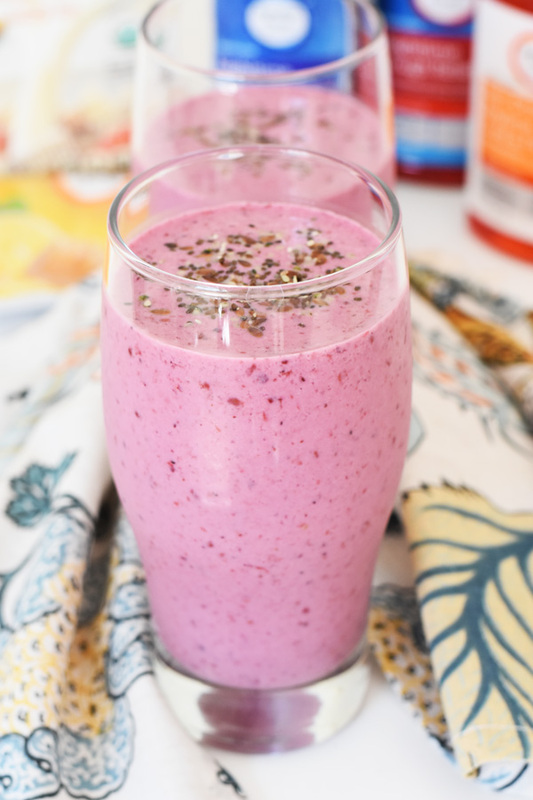 I love berry smoothies and making it organic is even more appealing to me! Looks like a delicious breakfast! I am going to try this during the week! 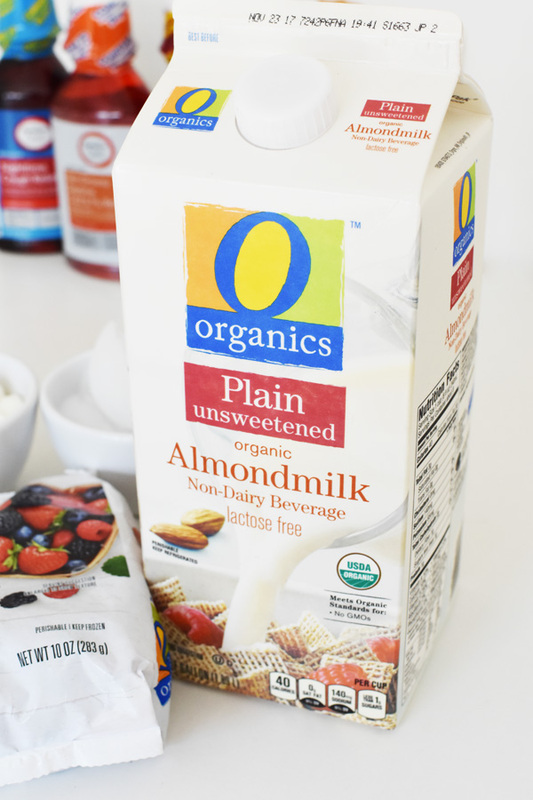 I love O Organics! however I had no idea there had so many products. I suffer from MCS (Multiple Chemical Sensitivity) so all my food needs to be organic. I’m loving your smoothie recipe. Perfect for my husband and me! I love smoothies because they’re so easy to make and best of all get in so much fruit/veggies in just one cup full. I normally have one at least once a week but it’s a great idea to ramp it up for antioxidant purposes!